With the running season starting a month ago and currently ADHM right here, I thought a throw back to the medieval times of running would be a good stress buster, after all it will be good for the new runners to know how their running ancestors; here in the short life of long distance running meaning just about 5-7 years ago started their running journeys. Cutting back to around 7 years ago, I had just met Rahul Verghese at a Seminar through a common friend and when asked what he does, the reply I got was that he motivates people to run. Now that was a strange answer to me as I could not think why in God’s name would anyone run in the times when motorized vehicles were available. Anyway a little persuasion from him and I got ready for my first run. Rest, as they say is history….damn Rahul, now I can’t live without running. 7 years back, running used to be about a post on Google Groups put up and strictly monitored by Rahul. There would be one simple post for a weekend run and all the runners from Gurgaon would turn up at a common place and do short distances like 5-10kms while chit chatting. Those preparing for a Half were the rock stars and most of us would listen to their words of wisdom with apt attention. Common places to run would be either Leisure valley or Club Florence in Gurgaon as starting point. With over 20 to 30 runners running together distance and pace was never a problem; one would always find someone to run with. 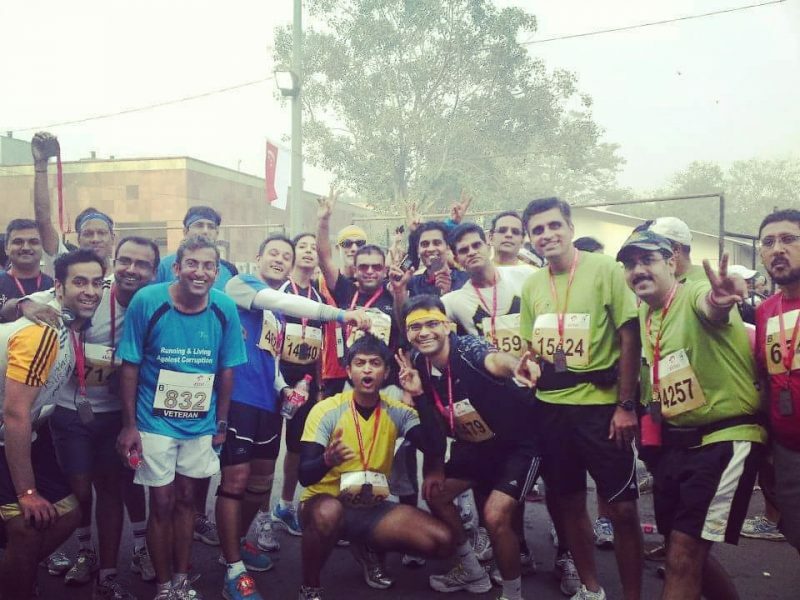 The two Events for all runners were ADHM and the Running & Living Winter Run. Expectations from oneself ranged from somehow finishing the run for most to a sub two for the ‘elite’ runners. Once a month would be a free supported event by Running & Living at LV for a distance upto 10Kms. This would be like a carnival where anyone who called himself or herself a runner would turn up to run together. Come winters and the fun quotient would take a quantum jump and these lovely morning runs would be supplemented with runs into the Aravali Trails where most of the times we would end up discovering a new trail. Besides these, there was this annual winter trail run which would lead us to new routes through the mountains to Damdama lake and have a picnic there. Summer was about many of us getting together with families and heading out for a run/swim and picnic. How can I also forget to mention the runs into the jungle in the middle of the night with families in tow and picnic baskets , running/walking a good 5 kms into the jungle to light bonfires and enjoy D&D with singing and dancing , desi ishtyle. Here it was not one Whatsapp group that would go but the entire running community of over 50-70 people. For the runners watches were for looking at time and not timing thus Garmin, Asics were just names for most and Brookes, Sauconys and Mizonos, Tom tom were not even names to us. However as all things, the age of innocence has to go and now, thanks to the amazing awareness spread through media and now seasoned runners, new runners start with a goal; and equipment to achieve them. The result is there for all to see, sub 1:45 is the new Sub 2 and the number of runners is now mind boggling. I do love the vibrancy that now defines running but sometimes do feel like singing that lovely old classic; koi lauta de mere beete hue din. Here is wishing all the runners a lovely running season and all the best for ADHM and SCMM; and as they said in the times of yore; Keertiman bhav.